McDonald’s Germany decided that, after 36 years, Germans probably had figured out how to pronounce the chain’s signature sandwich, and that spelling it phonetically in German would no longer be necessary. OK, well, officially it has to with “global unified branding”—The “FishMäc” has also become the globally-known Fillet-o-Fish. Granted the above is probably not worth more than a shug. We’re talking about Germany after all, the country that has invented more English words than hip hop. The rumor, that the [Fillet-o-Fish] consists of everything but fish, won’t be laid to rest. In reality, three different kinds of fish are used in Germany: Atlantic cod, Alaskan sea salmon, Merlucciidae. The [choice of fish] is seasonally dependent. [PR Person Eva Maria Haas]: However, it is important for us that there is no noticeable taste difference.” The balancing of the taste is enabled through an extra “spritzer” of tarter sauce. Of course, the Fillet-o-Fish’s taste is further balanced by the use of breading and a deep fryer. 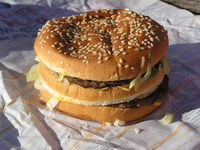 This entry was posted in Food & Drink and tagged fast food, Germany, McDonald's by Kai. Bookmark the permalink.